It’s a global sport; this isn’t a little sport anymore. Did you step out of your thrice-daily NFL draft meetings in time to catch the Boston Marathon on Monday? Did you see one of our country’s all-time great marathoners, Meb Keflezighi, not only keep the race close near the end but actually win it, the first time an American has captured Boston since 1983? And did you see him show more heart in 2 hours, 8 minutes and 37 seconds than my rudder-less Dallas Cowboys team has shown in the past 15 seasons? Did you happen to catch Shalane Flanagan’s act on the women’s side? The rhythmic bouncing of her blonde ponytail gracefully leading the pack for the first 18+ miles? And did you watch as she made it clear from the opening gun that she was in it to win it, fearlessly setting a blistering early pace that would ultimately betray her, before having to settle for a heart-breaking seventh-place finish? Never mind that her personal-best finish of 2:22:02 was the fastest time ever for an American woman in Boston, and would have won the race in 12 of the past 13 years. To say that emotions were running high out on the course on Monday would be like saying that the sinking of the Titanic was peculiar. True, I like to jab at ESPN now and again here on the blog for your unapologetic disinterest in the sport of running. Despite your network’s claim-in-the-name to being an Entertainment and Sports Programming Network, I certainly don’t come to you for my marathon updates on race day. On the other hand, I know I can always count on you for timely updates on NASCAR, golf, soccer, boxing, poker, lacrosse, mixed martial arts, the Bassmaster Classic and even the Scripps National Spelling Bee. Marathoning, though? Not so much. Last year on Patriots’ Day, for example, WNBA draft coverage on ESPN.com trumped the Boston Marathon, before two horrifying explosions forced you to confront both Boston and the running community in a way you never could have imagined. But now, on the heels of your coverage of last year’s bombings and Monday’s defiant resurgence, you have the opportunity and the resources to change all that. If you haven’t noticed, our country is in the midst of another running boom that makes that of the Bill Rodgers/Frank Shorter era look like the Geico lizard walking next to Godzilla. 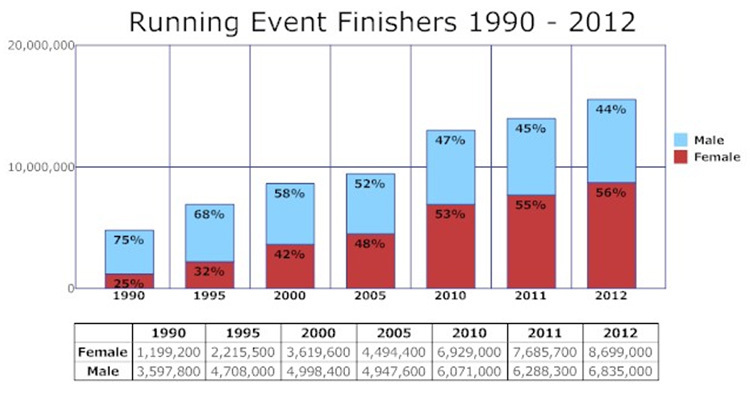 According to Running USA, in 2012 alone over 15.5 million runners crossed the finish line in a U.S. running event, including 487,000 marathoners. Since 2000 the number of race finishers in the U.S.has increased by 80%, and female representation has increased from 42% to an all-time high of 56% in 2012. Simply put, people like to run. Granted, people also like to sit and watch enormously gifted talents like Lebron James, Peyton Manning and a steroid-infused Barry Bonds perform acts of freakish athletic prowess. But anywhere there are athletes wearing team jerseys and brandishing over-the-top contracts, there also exists a fan base with an inevitable sense of detachment fueled by the sobering recognition that I could never in a million lifetimes do what they’re doing. I may – and in fact I do – love watching David Ortiz hit a baseball. But once I reached junior high and my Mr. Magoo-like eyesight and unexceptional hand-eye coordination kicked in, my own career as a baseball player was effectively over. Running, though, is different. Imagine stepping up to the plate in the World Series. Or sinking a clutch three-pointer in the NBA Finals. Or throwing a touchdown pass in the Super Bowl. Chances are, unless you win either the genetic lottery or a role in a Bud Light commercial, ain’t none of these ever going to happen for you. But imagine running on the same course, and at the same time, as some of the greatest and most highly trained athletes in the world. And now stop imagining, because not only is this a possibility, it’s a given. Because that’s what the Boston Marathon and the other World Marathon Majors (Berlin, Chicago, London, New York and Tokyo) are all about. With its singular qualifying standards, Boston in particular is the Super Bowl, World Series and World Cup of running all rolled into one – an event where decidedly non-elite competitors can run with (though not quite alongside) elite athletes like Meb and Shalane, whose huge hearts reflect more than just their cardiovascular fitness. I’m guessing more people would rather tune in to your network to hear 50K American record holder Josh Cox break down the elite field for Boston, than spend two minutes trying to decipher Barry Melrose‘s hockey talk and figure out what he has growing out of his skull. Admittedly I’m a hockey fan, and few sporting events rival the Stanley Cup playoffs for sheer drama, but Barry showing up on my TV is the mute button’s immediate cue to do its thing. You can do this, ESPN! It’s not like you have a shortage of time and space to fill, with your ridiculously extended family of networks – including ESPN, ESPN2, ESPN3, ESPN Films, ESPNews, ESPNU, ESPN Brazil, ESPN Classic, ESPN Deportes, ESPN Plus, the Longhorn Network and the SEC Network. ESPN2’s current five-year contract to broadcast the New York City Marathon is a step in the right direction, but it’s only one step. And I understand that NBC currently televises four of the other five world marathon majors on their obscure affiliate Universal Sports Network – but they seem unwilling to give endurance running the exposure it deserves, to promote it front and center rather than book-ending each marathon telecast by true fringe sports like cycling and rugby. Remind me again, how many Americans competed in a rugby match last year? Not only that, but ESPN’s budget would allow the network the luxury of buying video equipment that won’t glitch right in the middle of the marathon action (thanks Universal, for that decidedly below-average feed of the women’s race on Monday). Maybe you’ll argue that running isn’t enough of an American sport, since we don’t restrict participation to North America-based teams while still labeling the championship a “World” Series. But geographical borders in professional sports are now more perception than reality anyway – just look to the wealth of Latin American and Asian talent on Major League Baseball rosters, or to the influx of European players in the National Basketball Association. Even the born-and-bred-here National Football League has kicked around the idea of putting a team in London. Hockey, golf, tennis, even that spelling bee I mentioned – sporting competitions are increasingly global events played out on international stages. And with 90 countries represented at Monday’s Boston Marathon (compared to 32 in this year’s FIFA World Cup), the marathon embraces the international stage like no other sport. Maybe, too, you’ll point to the recent dominance of the sport by Kenyan and Ethiopian runners, in which case you’d be absolutely right – before Monday, East Africans had won every Boston Marathon since 1991. But Meb’s victory shows that America can still compete on running’s biggest stages, as does the inclusion of two other American men – Nicholas Arciniaga and Jeffrey Eggleston – among this year’s top ten finishers. Likewise, Jason Hartmann finished fourth here in each of the past two years. And let’s not forget that American Desi Linden (née Davila), the Boston 2011 women’s runner-up, lost that race by two seconds. So then given our nation’s wealth of athletic talent and resources, coupled with ESPN’s clout and ability to educate a vast and impressionable audience from a young age, there’s no reason to think the future of endurance running in this country can’t be dazzlingly bright. Plus, as parental and scientific concerns about concussions continue to escalate, we’ll soon need somewhere to divert all the talented young’uns who might otherwise turn their attention to football. Your network’s capacity to reach and inspire new generations of endurance athletes would be just the beginning. At the same time, you’d be motivating the average couch potato/weekend warrior to open their mind to self-improvement, and to try their hand feet at a sport for which the necessary equipment is genetically provided (with the exception of shoes and hopefully shorts), the obstacles to participation are minimal, and the venue lies right outside their door. Tuning into the Boston or Chicago or London Marathon and watching thousands of runners, some with physiques not unlike their own, compete in the same arena as the elites may get them thinking that maybe, just maybe, running isn’t as bad for their knees and other joints as they’ve been led to believe. Even my Mom, who hasn’t run a day in her life, found herself tuning back into the Universal Sports Network yesterday to catch a re-broadcast of last weekend’s Rotterdam Marathon. Nothing reinforces for me the awesome power of running more than reading an email from Mom with the name “Kipchoge” spelled and used correctly. Taking my argument for ESPN’s involvement in the sport a step further, I envision Meb and Shalane as the “Tiger Woods(es) of running” – minus the surly personality, overturned SUV and sensationalized divorce. What Tiger did (however unintentionally) in attracting a whole new generation to the sport of golf, they could very well do for running. And in the ongoing battle against childhood obesity, I’d wager that reaching that target audience through a couple of world-class athletes on a high-profile sports network would nicely complement the First Lady’s own “Just say no to fat kids” campaign. If it’s sponsorships and advertising revenue you’re worried about, I can promise you that runners love their gear, apparel, fitness gadgets and nutritional supplements like no other demographic. Running USA’s “State of the Sport” report from June 2013 concluded that the running industry is thriving despite a still-sluggish economy. And since marathoners don’t wear team uniforms during races (the Olympics being a notable exception), the potential advertising opportunities for elites to run with their sponsor’s logo(s) emblazoned across their chest is a no-brainer. Plus, with your network placing a premium on the “cool” factor of the one-name superstar (Lebron, Kobe, Papi), humble and articulate athletes like Meb and Shalane should integrate seamlessly into the ESPN marketing machine. 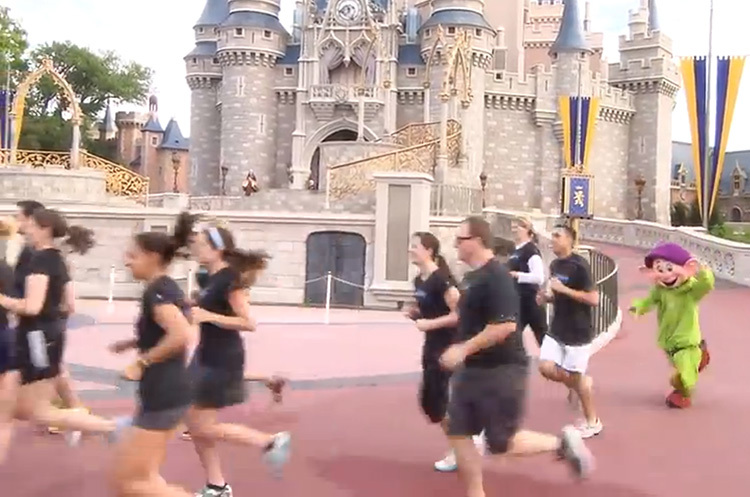 As a Disney subsidiary, you’ve experienced first-hand the enormous growth of your parent company’s own running events in recent years. Every new race event offered by the geniuses at Disney, despite increasingly exorbitant price tags, reaches capacity before you can say “Steamboat Willie”. One of Disney’s most popular events, for example, the Dopey Challenge, allows participants to run a 5K, 10K, half marathon and marathon through the Disney World theme parks in the span of four days, along the way collecting six different medals at the seemingly goofy price of $10.90 PER MILE (thanks to Dan for crunching these numbers and providing this perspective). Now then, can I interest you in a series of ESPN-produced running events? The timing couldn’t be better, particularly in light of the explosive popularity of adventure racing in this country. So then Mr. Skipper, it’s time for your network to step up and ride the Meb wave – after all, it’s a strategy that’s certainly working for Skechers. Clearly ESPN and the sport of running have a lot to offer each other. I’d be happy to lend my expertise and consulting services to an ESPN race series, or to help a fledgling ESPN Running network get off the ground, starting with my recommendations for compelling programming opportunities. If you’re interested, feel free to reach me through the Comments section of the blog. In the meantime, since I have your attention, can we please talk about Barry Melrose’s hair…?